If you are the only person in the world who has never seen someone stand up in front of a projector and give a presentation, then 1) how did that happen? and 2) you might be clueless to what constitutes a good presentation deck. But, if you have ever been in the audience, then you have at least some idea of which presentations you pay attention to, and which ones you don’t. What decks are complicated and confusing, and what decks simply support and enhance the speaker. And, even for the most artistically-challenged, you have an idea of what looks good and what clearly looks bad. So why is it so difficult to design your own pitch deck? Well, for one, you’re too close to it. You know all the nitty gritty details of your company. And you want to share everything that you find awesome about what you’re working on. The “what is says” overrides the “how it looks” when you review your work. It can be hard to see where your pitch deck makes the same mistakes as the bad presentations you’ve seen before. As startup storytellers and pitch deck design experts, we have compiled some design guidelines that we use every day. So to help you get started, we’re launching a series of articles to cover all the important elements of design that can be used in creating your pitch deck. Stay tuned for detailed articles on each topic.  For more information on what your pitch deck should cover, visit our Pitch Deck Content Series.